He needs to work on the salute thing. That picture is hilarious! He's trying so hard! 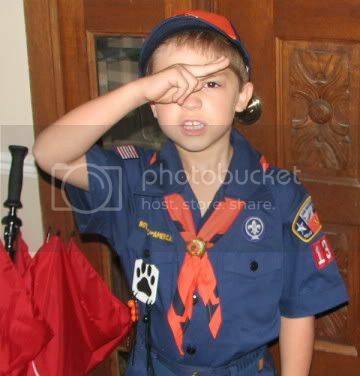 Congrats little Tiger Scout! Connor's still working on his, they've all gotten their bobcat though. Adorable! So cute. And I think his salute is precious! Adorable....dont' you love sewing on patches. It gets worse. My little guy is a wolf now and I've sewn on more patches than I ever thought I would have to. Oh my...how frikkin' adorable is he? He looks so handsome in his uniform! annie-too lazy to log in.